The USED 2003 HONDA CRF for Sale needs absolutely no work and runs good! I'm looking for offers on this sporty little dirt bike that's ready to ride! I'm selling with 2 spare front tires and 1 spare rear tire. 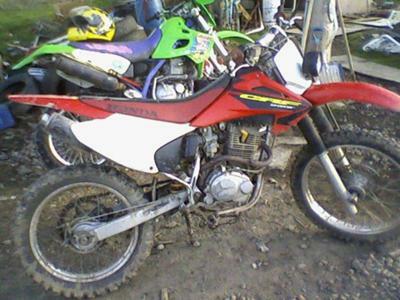 The used Honda CRF for sale is located in Bainbridge, New York. If you're interested you can leave your comments and opinions in the space below provided by Strike Lightning for listing Used Dirt Bikes for Sale. Strike Lightning would also encourage bikers to submit a review of the 2003 HONDA CRF for Sale to help potential buyers make informed decisions and to benefit the biker community as a whole. How much do want ???? How much are you asking and are u willing to do any trading?